Everyone knows that the best way to keep employees productive is to offer them monetary rewards as an incentive for productivity, right? Wrong. 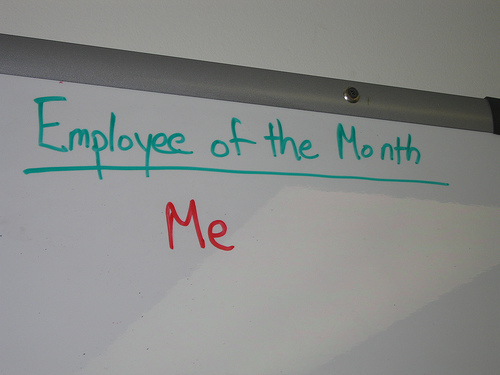 In fact, studies are finding that these types of rewards actually demotivate your employees. Instead, create a better, more productive work environment with a different kind of incentive. Traditionally, productivity is viewed in very basic terms – if you do this, I will offer you this amount of money as a reward. This system is much like getting a horse to work by dangling a carrot on a stick in front of him. But employees aren’t horses. They aren’t motivated by the carrot. And, dangling a carrot in front of your best and brightest employees may actually cause them to seek employment elsewhere. Contrary to popular belief, money isn’t a motivating factor. It can only motivate your employees for so long before it no longer becomes incentive enough for them to continue working as hard. This is because as humans, our brains aren’t hardwired for money. Instead, humans are purpose driven. In order to be productive, and more importantly happy, employees must feel like what they are doing has a purpose, and that this purpose will better their life in more ways than the accumulation of a few extra dollars. How do you empower your employees with purpose instead of leading them with a carrot? By using these 3 factors as motivation instead. Autonomy: The ability to be self-directed and direct their own lives and workflow in the office. If you want employees who are engaged and energized in the office, allow them to be their own manager when it comes to their specific work. Mastery: People desire to master difficult things. The need to master something difficult is the whole reason people play instruments on the weekend, or learn to program for fun. They don’t do it because they are getting paid to learn these things; they do it for the thrill of learning and mastering something difficult. Purpose: Having autonomy and mastery often leads to purpose. People want to feel like what they are doing matters. If an employee doesn’t understand the purpose behind their work, the bigger picture of who they are helping and why, the work becomes meaningless, and over time can stifle the creativity and potential of the employee, ultimately demotivating them. So what kind of business do you want? One where employees that “toe the line” and follow orders, never innovating or growing the business; or one where employees are energized to come to work, happy to help and ready to innovate because they feel like what they are contributing really makes a difference in the world? In order for your business to survive today, the answer is clear – chuck the carrot. For more information about how autonomy, mastery, and purpose are more motivational than money, check out this animated speech by RSA. Julie Strier is a freelance writer who enjoys bringing peace and calm to your business. Email: julie@mybusinesswriter.com. Website: www.mybusinesswriter.com.